Conserving water is everybody’s business. Global warming is everyone’s problem and everyone is affected. This is a serious matter that has affected a lot of lives in the world especially those living in drought-prone areas like Africa. If you are living in a drought-prone zone even if it is not in Africa, then conserving should be high on your list. However, this could pose a little issue with your plant garden who needs the water to keep itself green and healthy. Still, it bugs you that you cannot give it the water it needs as liberally as you would want. It is a good thing though if you can still go on with your garden while still being able to do your part in conserving water for everyone’s common good. • Mulching is a good way to protect your plants from the dehydrating effects of the sun. The mulch does not cover your plant but it does cover the soil in order to keep the moisture in the ground and not dehydrating your plant. Adding compost will also help since compost contains a lot of nutrients and is a bit damp. Hence, additional water is no longer necessary. • When thinking of which plants to be planted in your garden, consider those that are low-maintenance in terms of their water needs. There’s more than just cactus to choose from. There are actually annuals that fare well in the midst of heat and would survive in a well-drained ground. Choose you plants wisely. Do not go for just the looks but its sustainability in the face of drought as well. • Consider applying sprinklers on your lawn or garden. These can be quite an investment, yet it saves a lot of water since it just “sprinkles” them and not bathe the plants which is what most of us are guilty of doing. Place them in areas where water really hits the plants and grass and not your driveway. • Look out for your hose and see if it is still dripping after you have turned off the tap. Water can still be found inside the hose and it will just spill so better sprinkle the last remaining water into your plants. Also, get a nozzle that controls the amount of water coming from your water hose so that you do not end up wasting too much water. • Dry soil will not immediately take up the water you have sprinkled. You will see water spilling from pots or forming puddles. Allow some time to let the water get into the dry soil so that you do not waste so much of it. 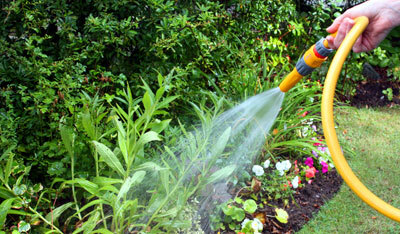 • Water your plants in the morning or late in the afternoon where the sun isn’t scorching hot. Watering the plants when the sun is overhead will not be as effective since a lot will just evaporate because it is too hot out. • Recycle water is conserving water. Water that has been used for cleaning the clothes or dishes may be sprinkled on the ground just to keep it moist.